← Media Review – Andrew Keen: What is Social Media Really Doing to our Society? Clemencia Rodriguez is a captivating storyteller who uses imagery and thought-provoking ideas to make an argument for why citizen media recognizes its highest potential when used as a vehicle of peace. 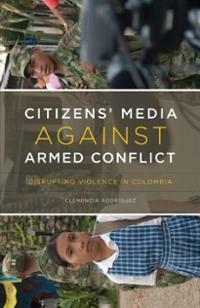 Throughout her book Citizens’ Media Against Armed Conflict: Disrupting Violence in Colombia, Rodriguez chooses to focus on the benefits and successes of citizen media rather than on the challenges involved in creating and maintaining them. She presents three case studies to support her argument and examines citizens’ media in the Colombian Amazon, Montes de María and Magdalena Medio. Rodriguez begins by establishing that there is a difference between community media, which is granted to organizations or individuals by the state and often used as a “loudspeaker for political elite” (p. 26), and citizens’ media, which serves as a tool empowering individuals to “name the world in their own terms” (p.24). While acknowledging that there are some difficult obstacles to creating and maintaining citizens’ media, Rodriguez is clear about her intention to examine the positive role of citizens’ media in resisting armed conflict. The vulnerabilities of these media have been pointed out by other scholars and include the transience or inexperience of volunteers, lack of financial stability and the risk of being “co-opted by local religious or political figures” (p. 156). By observing the citizens’ media of the three aforementioned areas of Colombia, Rodriguez is able to identify how “media are used to open communication spaces where cultural processes, art production, and storytelling can repair torn social fabrics, reconstruct eroded social bonds, reappropriate public spaces, and strengthen strategies of non-violent conflict resolution” (p. 22). Citizens know their landscape and their culture so they are able to tailor interactions to meet local conditions and concerns. In the Colombian Amazon the local radio station, Radio Andaquí, uses the “radiocycle” (literally a bicycle to which they attach portable broadcasting equipment) to bring the technology to community members so that their voices may be heard regardless of the fact that they live in rural areas across tricky terrain. Citizens’ media also helps empower the people by giving them a voice to participate in local decision-making processes, monitor local governments, demand accountability and to stay well informed on issues and news that affect them. In Magdalena Medio AREDMAG is “one of the most notable community media initiatives in Colombia” (p.135) and it seeks to “implement a strong participatory democracy” (p. 162) through several efforts. During the public event, Rendición de Cuentas, the mayor explains his fiscal management over the past year. If he tries to procrastinate the local radio station reminds him publicly over the airwaves; accompanied by a high-pitched, crow-like sound. Another program encourages “citizens’ oversight of public services” (p.163) by allowing them a space to voice their complaints, pressuring the mayor to see to the community’s needs. These media bring together individuals with differing views, ideas and beliefs, and in doing so, succeed in what is arguably their most important role: to create a “space in which peaceful interpersonal interaction is normalized, where difference is not only respected but appreciated, and where the experience of living in a peaceful environment can be felt and embodied in everyday life” (p.101). In Montes de María, “The Communications Collective” takes back public spaces by bringing people together to watch public movies. It also teaches the skill of nonviolent conflict resolution in an environment that values differences and promotes the idea that those differences make the group stronger. Citizens’ media helps foster “belonging and sense of place” (p.169), while allowing individuals “to confront feelings of fear and isolation and engage in a collective action of resistance through communication processes” (p.62). Rodriguez praises this role of citizens’ media and argues against their use to report on armed violence, to act as watchdogs of armed groups, or their use as vehicles for solely one-way dissemination of persuasive communication. She maintains that other organizations, such as nongovernmental organizations and international media “can more effectively perform these overtly political actions” (p.230). Rodriguez makes a compelling case for what works in citizens’ media, what does not, and how they are used to counteract fear and oppression of community members caught in the middle of violent conflict between armed groups. She asserts the need for further study on how citizens’ media are “figuring out ways to help protect civilians, coordinate collective actions against armed violence, redistribute scarce resources, de-escalate conflict, and create cultural and communication buffers against collective terror” (p.78). She also makes a note that citizens’ media in other countries should be examined in order to accomplish this. The role of citizens’ media in reducing fear and bringing a sense of normalcy into the lives of those living in areas where there is armed conflict is both fascinating and uplifting. Rodriguez uses clear examples to illustrate this role and presents the reader with a comprehensive history of each of the areas discussed, as well as the challenges faced by members of each of the communities. The effect is to make the reader feel a personal connection with the individuals, provoking very real feelings of empathy and compassion. Having read about the lives of some of these individuals, I echo Rodriguez’ call for further study on these media. Rodríguez, C. (2011). Citizens’ Media Against Armed Conflict: Disrupting Violence in Colombia. Minneapolis: The University of Minnesota Press. Gallery | This entry was posted in media culture society and tagged armed conflict, Citizens' media, Clemencia Rodriguez, Colombia. Bookmark the permalink.